A heartfelt thanks to everyone for their kind and supportive comments. I'm sorry for not replying to you all as I normally do, but I've been busy getting all my tools and equipment off of Lady Jane. It's amazing just how much I've amassed over the years. By the time Lady Jane is sold, all my stuff will have been stripped out and the boats systems left pretty much like she was when I bought her. 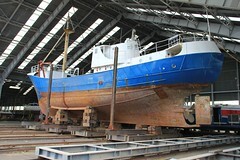 She will go for scrap, as I see no end in sight to the spending, even after the hull repair is paid for. I just don't have that kind of money. No, it's not a prank. With Lady Jane now out of the water, and her hull properly cleaned off, it's obvious the hull is severely corroded. The jetwash alone blew a few holes in the hull! It's a fact that the hull is too far gone for me to be able to afford a proper repair. 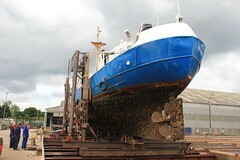 She is to be patched up, the good stuff stripped out, dumped back in the water and sold for scrap. Obviously there is a lot to deal with here, which will take time. It's a very sad moment, both for me and for all who have worked so hard on her, but the fact is one private person, with limited funds, cannot really stay on top of such a huge undertaking. I have no real regrets, and consider I've had a huge amount of fun and learning over the last seven years. Plus, of course, I've made some valuable friends. This is not the end of the dream, just the realisation that Lady Jane is not the vessel to deliver on the dream. I can hardly believe it myself, to see Lady Jane actually inside a shed! Hythe marine park makes the old girl look quite small really. There had been some discussion about possibly cutting the mast off, or at least trimming it, but in the end she fitted right under with no problem at all. I'd say that if you have a boat in the Southampton or Solent area, and are looking to get her lifted out the water, speak to the guys here. If you mention that Tim from Lady Jane sent you, you are sure to get a good deal. These guys are more than happy to assist with some of the work that I need doing, and are equally happy if I do stuff for myself. The hull and engine room fittings work I'm leaving to the experts, in the long run it will be cheaper for me. The rest I'll do myself. 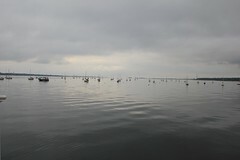 Here is Southampton Water, first thing in the morning. It is such fun having a different view from Lady Jane, for a change. 'Proper' work will commence shortly. 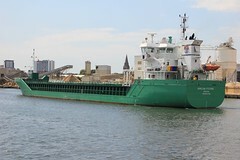 Being at Hythe Marine Park provides an ideal opportunity for a bit of ship spotting. Here you see the Queen Mary 2 nosing her way out of Southampton, bound for more northern climes. I have spent a few pleasant evenings on my back deck in the late afternoon sun, with the marine radio on in the background, so I know which vessels are about, and a cool beer to hand, simply watching the world go by. 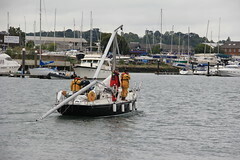 Here's another view of Lady Jane, taken just after she was taken out of the water. All that marine growth is now gone, built up over the years since I came round from Fareham over four years ago. 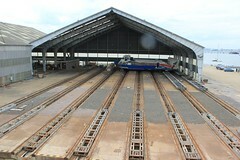 The people standing to the left there give some idea of the sheer size of the vessel. I have quite a list of things that need doing. With Lady Jane now out of the water, the next step is to clean her bottom and assess what needs doing from there. As soon as Lady Jane has been cleaned up, she will then be side-slipped, using the railway tracks you can see, into the big shed there. Boats which don't have tall masts like mine go into a slightly less tall, but much larger, shed. I'm very impressed by the apparent ease of the whole operation, and the folks at Solent Refit have done a sterling job so far. Everything about this place is on such a vast scale, it's a little hard to believe. By their standards, Lady Jane is not that big! I thought it might be fun to make a clip of our short jump across to Hythe last week. This is really as a result of John's request to replay the journey. The wobbly images are probably on account of the webcam being vibrated while the picture was being taken. 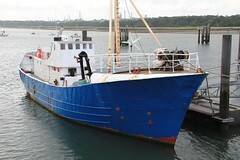 Here is Lady Jane in her new, temporary, berth. On Thursday we moved the old girl round from her mooring on the River Itchen and across Southampton Water to Hythe, where she is now alongside at Hythe Marine Park. My special thanks to both John, skipper, and Duncan, first mate, who made it all look easy. We were going to move Lady Jane on Friday, but the weather forecast was for much friskier winds than seemed sensible, so we jumped on Thursday instead. 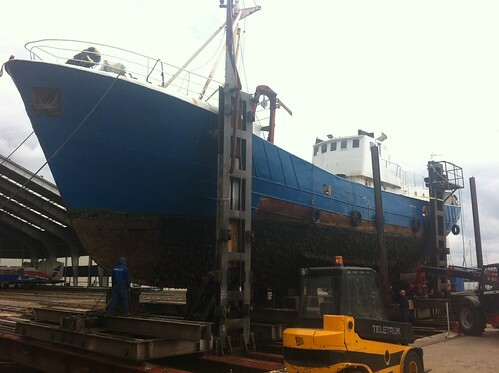 The plan is to lift her out the water on the slip they have here later on this week, weather depending of course. Hythe Marine Park is vast, and Lady Jane is completely dwarfed by her new surroundings. I'm loving the new spot we are in. I've seen the future, and it's an Arklow Future. Looks quite green as well! 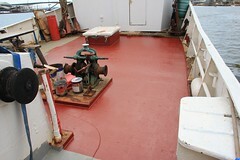 It looks the same as the last picture, I know, but this is the deck after another coat of red primer. The first coat was just single pack primer, painted simply to prevent the rust busting effort from going to waste with the rain looming. This red is the proper Hempel two pack epoxy primer I usually use. The eagle eyed webcam watchers amongst you have already noticed that this blog post is a little behind, and I've also now got a coat of grey down on the deck as well. I saw these guys going past the other weekend. I can't help but wonder what happened there. Whatever it was, it looks expensive!